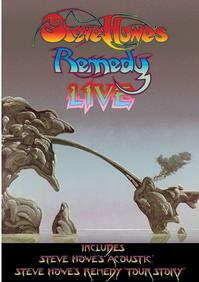 I really enjoyed the Steve Howe’s Remedy album. I never got to see this outfit live, though. Well, I sort of have gotten to enjoy that experience now, and enjoy it I did. They played a lot of music from the self-same album and some Yes songs here and there. It’s cool to see Howe performing outside of Yes. The man can play guitar like no other. That much is certain. The music here is powerful and exciting and should please fans of Howe, but also fans of guitar or progressive rock in general. The video and audio quality are both great, and this really is a “must have” for Steve Howe fans, plain and simple. You sort of get three separate shows here. One show is the hour long concert with the band. Then there’s a half hour performance of just Steve Howe playing acoustically and there’s also a documentary. It’s all quite strong. This is extremely highly recommended. Of course, I guess I should qualify that by saying I am a big fan of Steve Howe.